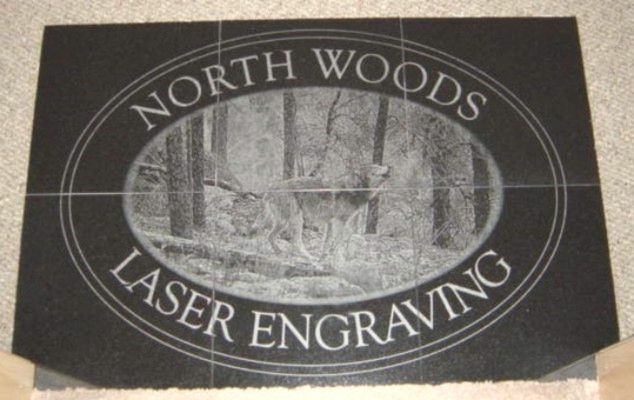 Our Black Granite Floor Tiles are engraved with breathtaking artistic quality to create a one-of-a-kind floor, wall mural, fireplace hearth, or fireplace surround. These 12" x 12" x 3/8" thick tiles are engraved to be butted tight together without grout between the seams. We also can cut and engrave 6" x 6" or 6" x 12" tiles, or any custom size for your fireplace hearth or surround. Fill out our order form, then mail or email it to us along with your studio quality photograph and the engraved text and other images you would like. We do absolutely no damage to your photo, plus we can artistically remove people or objects from your photo engraving. Not sure what text and font type to choose, or images to add? See our ENGRAVING OPTIONS page or CONTACT US for help, we have done many unique themes and are always creating more.